The origins and rise of Morris and Traditional Folk Dancing. How Morris Dancing relates to Paganism and Tradition in the British Isles. While chugging a cider at our local medieval fair, some ten years ago, I found my heart warmed by the sounds of jingle bells and of staves being cracked together in time to a merry tune wrought from a fiddle accompanied by penny whistle and drums. A local team of Morris dancers was keeping the tradition alive right here in Florida! For those unfamiliar with ‘The Morris’ it is a form of English folk dancing, that has taken up a revival of sorts in recent years. 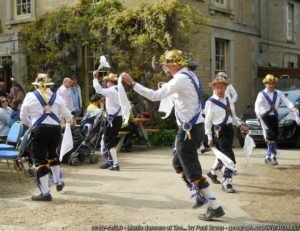 Traditionally the morris men (and it was a male dance), hop and skip in time with bells on their shins and arms, wearing breeches and brightly coloured sashes over white shirts, sometimes waving handkerchiefs and sometimes knocking together sticks. Much debate is to be had over the origins of the peculiar style of dancing. The name alone is a mystery, some say it is the dance of the people of the moors, while others say that it is the dance of the Moorish people! Some claim it is a renaissance invention, whilst many, like myself, believe the origins to be much, much older. 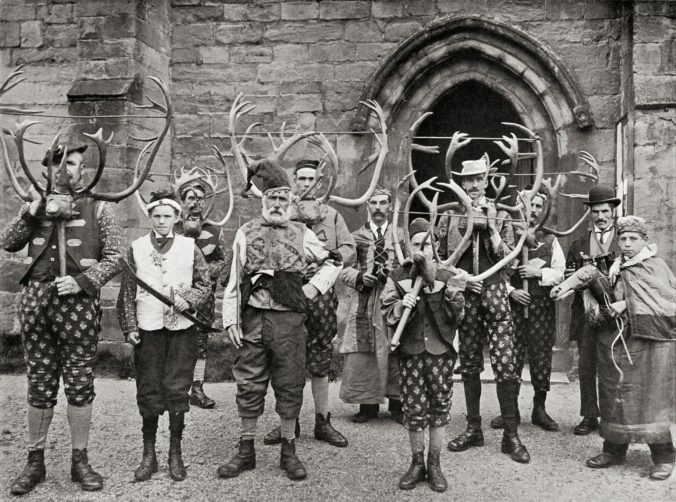 The Abbots Bromley Horn Dance, while not strictly a morris dance, seems to be of great vintage, still performed annually with reindeer antlers that have been carbon dated to the 11th century, long after the beasts became extinct in the British isles. These antlers came from Scandinavia, and the dance seems to be accepted as part of a Pagan tradition. Whilst Saxo Grammaticus may have had his own religious axe to grind, for those who have witnessed the hankie-waving Cotswold Morris, it’s hard to think of a better description than ‘effeminate gestures’ and ‘the unmanly clatter of the bells’. It wouldn’t be out of place for hunting rituals to be dedicated to Frey and brought to Mercia by Danish invaders, and the Abbots Bromley horn dance could certainly fall into that category. Elements of these ritual dances would be kept and misunderstood by the uninitiated for generations, as the meanings are lost in time. Perhaps Starkadder’s objection to the effeminacy of the priests explains the ‘Maid Marian’ figure in the horn dance, which is always a male dressed in female attire. Perhaps the hobby horse that is present, is also sacred in some way, just as the sacrificial horse dedicated to Frey in the Icelandic saga ‘Hrafnkel, Frey’s Gothi (priest)’. Regardless of origin, both morris and the horn dance are part of the folk tradition of the British isles, which encapsulates the spirit of a folk, and to my eyes, that supersedes any claim to religiosity, as the true folk religion belongs to the spirit of the Folk that created and embraced it. A certain part of me balks at modern interventions as the dances change and evolve, but even as staunch as I can be, I try to see the reason in the natural evolution of our folkways. 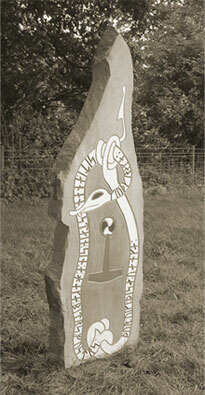 Certainly, morris dancing seems to be on the up, but it is also changing form. We have seen the rise of ‘Border Morris’, a more vigorous form of the dance from the Welsh border. Border Morris has been the source of much controversy, attacked by traditional dancers for it’s often mixed sets (where women dance alongside men, although this dates back in certain areas, to at least the 18th century, it has never been the norm), modern instrumentation and heavy Pagan leanings. When one observes the spectacle of Border morris, it’s hard not to be taken in by its polar opposition to the more common morris troupe. Traditional morris seems scrubbed clean, perhaps by the Victorians, but Border is far less refined. Where the traditional morris teams are often named for their villages, the Border dancers give their teams names like ‘Bloodstone’, ‘Witchmen’, and ‘Beltane’. The typical Border dancer is clad in a black rag coat, a top hat crested with feathers, Dr. Martin’s boots and bedecked with silver skulls, or other gothic imagery. Their cries aren’t jeers but hollers, and the dance seems like a stomp, rather than a prance. 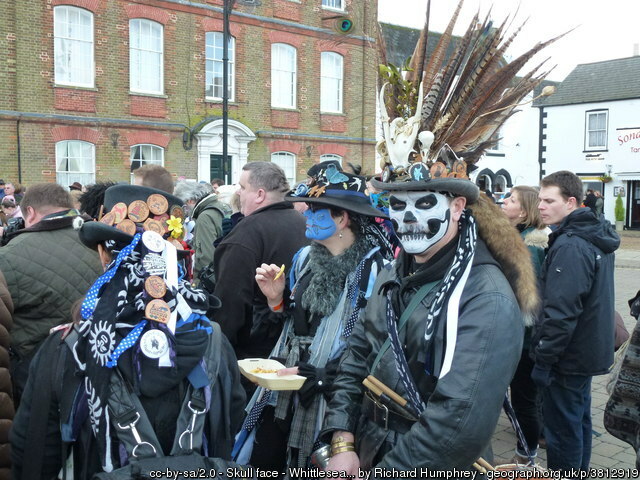 The sudden enthusiasm for Border morris is easy to see, for one, the black face paint they wear gives anonymity, important in ancient times, but perhaps all the more now when morris dancing is less enticing to the youth. From the esoteric perspective, if the Traditional dance is indeed descended from Frey’s priests, it would seem that Border derives from the spirit of Woden. Watching the feathered hats and rag coats bouncing accompanied by whoops and caws, it is impossible, not to feel as if this is some kind of dance for the Raven God of the Slain. He didn’t like the Morris. An American Morris dancer who I talked to was quick to decry the Border Morris as ‘racist’ because it is often performed by dancers with blackened faces. This poor woman was ignorant to the idea that the coal black face most likely came from the miners that first performed it, although there are the typical university types who push the absurd idea that it traveled across the ocean from American Minstrel shows and through the medium of vaudeville into these small English country villages! 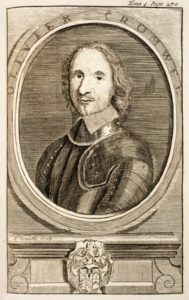 It should also be pointed out that the only time in which morris dances were stopped was during the Interregnum, the reign of the despicable Oliver Cromwell. No doubt the newest New Model Army, comprised of Social Justice Warriors and other Neo-Puritans would love to see a stop to all our traditions. Ironically, there are those within the Border Morris crowd who believe that what they are doing is specifically anti-traditional and that can only be a good thing. This is also very silly and I can only hope that point of view is limited to a few fringe loonies. 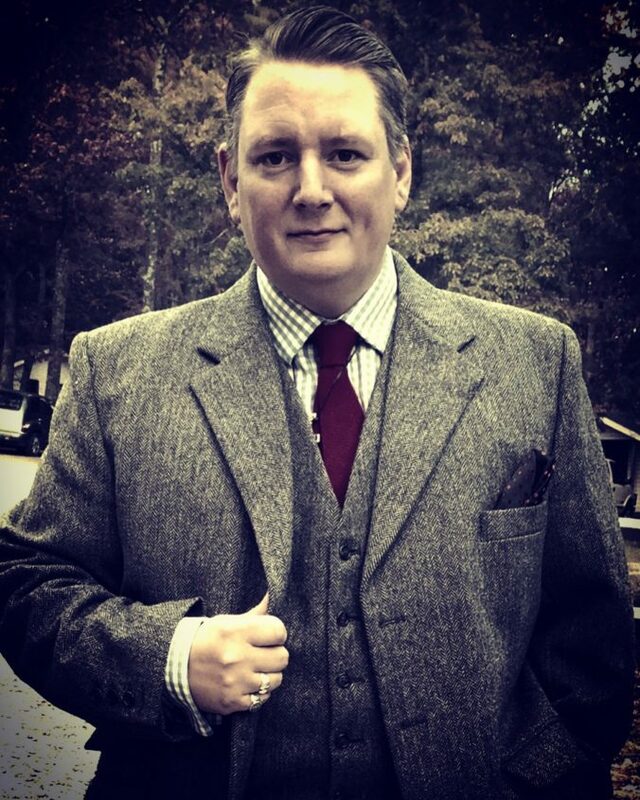 It’s interesting to see this new evolution rise as there is a far greater interest in English folk tradition now, than at any time in my life. I see a place for both styles, and hope that they continue to thrive with greater enthusiasm, and I am delighted to see my friends continue the morris here in the US. Regardless of whether you believe that Border morris is Anti-Traditional or merely an evolution of tradition, or you think that morris should be performed only by men at the appropriate seasonal festival, one thing that we should agree on, is that the morris is best performed and observed after a proper English pint. Our Border Morris team, Ladies of the Rolling Pin, does both very traditional and our own takes on traditional dances. We have learned from such disparate sources like traditional teams in Cornwall, and other spots in England and from youtube. As shown by our name, we are on the lighter side of Border (sometimes to my consternation as I would really, really like to do Katy Cruel!) But our audience is usually families and our squire feels that some of the darker dances won’t be well received. For my own take, all Morris needs to both evolve to fit the times (or number of dancers) and to hold on to the traditional dances so they will not be lost or forgotten. Accompanied by a pint, of course! Fascinating! Thank you for the link.